Frankenstein is an armchair and footstool designed for New Balance UK. Designed as a piece to represent the manufacturing process of trainers at there UK factory in Flimby, Cumbria. The chair and stool comprise of over 170 hand upholstered cushions made from recycled foam off-cuts, reflective New Balance buttons and materials from their Made in the UK Leather Cutters collection. They pay tribute to the makers and longest severing craftsmen of the Flimby factory. 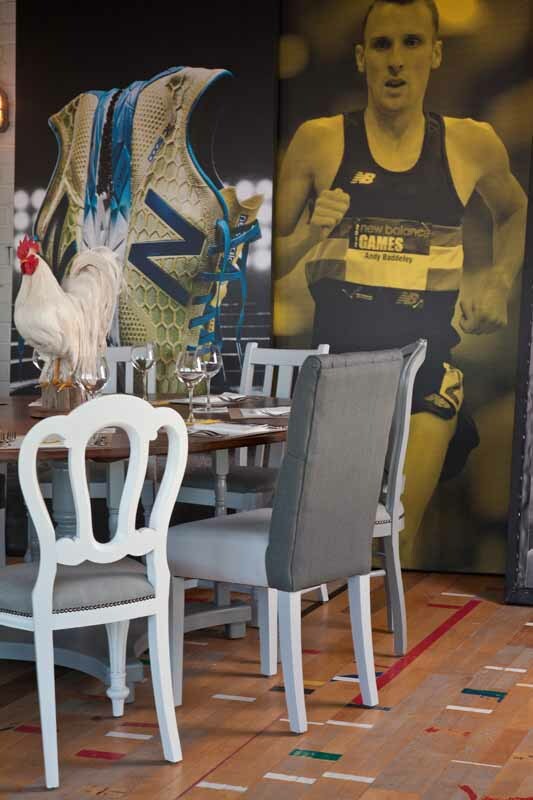 Once made Frank then traveled to Millbank Tower, Westminster to feature as a fitting in the New Balance Olympic Experience Centre. The experience centre was a set up to host athletes and associates affiliated with the brand as a meeting place, chill out lounge and restaurant over the course of the London 2012 Olympic Games. Project in collaboration with Sezar Alkassab and Josh Tomkins.